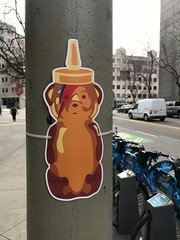 On the way to work this morning I noticed SOMA had been invaded by honey bears. 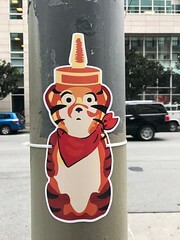 Anyone familiar with local street art — or regular readers of this blog — would immediately recognize this as the work of fnnch. But what was up with all the bears appearing at once? And why were they strapped to the utility poles instead of painted on? I didn’t have to wait long to find out, because pretty much every local news outlet covered the project. 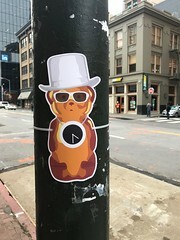 To sum up an already short story, fnnch got a bunch of friends together to raise awareness of a petition to decriminalize certain types of street art. But to learn more in fnnch’s own words, check out this post on Medium about the project.